User Guide for the Pull Reports™ Ad Hoc Reporting and data services software. The Pull Reports™ software provides ad hoc reporting, mapping, and data services for any dataset over the web. It is distributed as a Java Archive (JAR) file designed to be served within a Java WAR application. Pull Reports™ has two primary components. First, the Pull Reports Servlet translates a RESTful query API into a SQL query against an underlying relational database and returns the results in multiple computer and human readable formats. Second, the Pull Reports™ Report Creator is a embeddable HTML5 client that presents the query API in a powerful yet easy-to-understand user interface allowing analyst professionals and "data enthusiasts" alike to join, filter, sort, visualize, and download the data that they need. Administering Pull Reports™ is accomplished via configuration files within the installation WAR. See the Administration Guide for information on administrating the Pull Reports™ license, security, logging, report decoration, and resource tuning. Pull Reports™ requires a valid license to be used within a production environment. To purchase a license, visit https://www.pullreports.com. Additionally, please read the license agreement carefully before installing the software. To create a trial installation, please email <sales@pullreports.com> and a customer service representative will give you temporary credentials to the Pull Reports™ Maven repository. 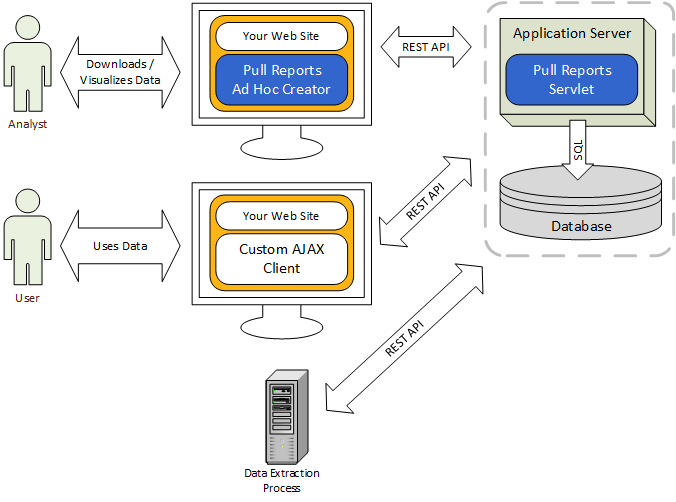 Pull Reports™ are configured via Pull Reports™ XML Catalog files for simple, declarative report definition or via the Catalog Configuration Java API for advanced, programmatic report definition. Each report definition creates unique endpoints within the Pull Reports REST API to support human and machine readable data exports. A demo of the Pull Reports™ Report Creator is available at http://demo.pullreports.com. Pull Reports™ are RESTful data services which return results in human readable formats like HTML or CSV and machine readable formats such as JSON, XML, and KML. Embed Pull Reports™ as a flexible and secure data service middleware between your data and network clients. 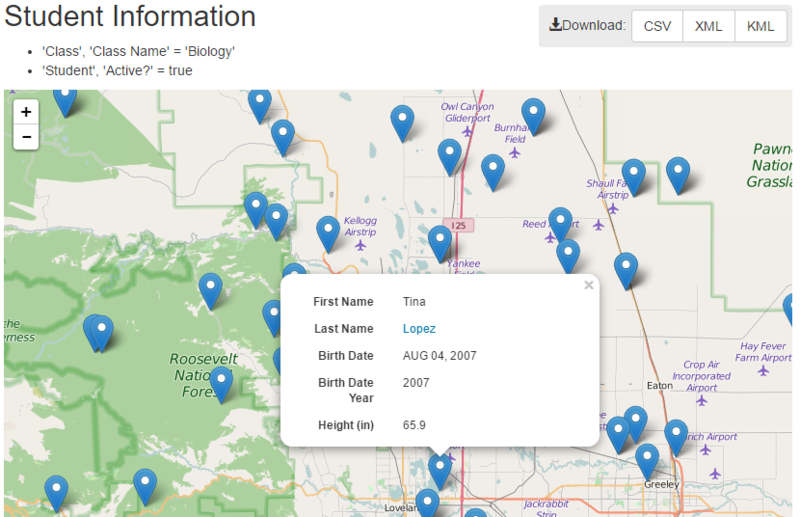 See an example web page built on Pull Reports data services at: http://demo.pullreports.com/student/1000. Pull Reports™ supports KML and GeoJSON standards compliant export formats for datasets with spatial information. These spatial exports may be visualized in third party commercial or open source mapping software. Additionally, Pull Reports™ natively supports a map export format which returns a customizable online mapper pre-loaded with the spatial results of a user's query. 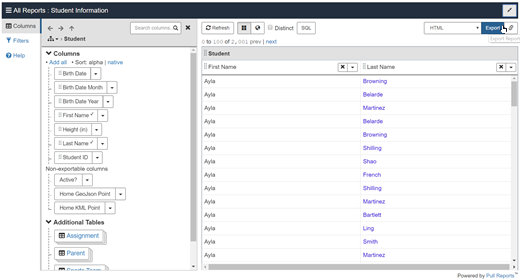 All spatial exports support the same filtration, sort, and relational join capabilities of the Pull Reports REST API.